Der Artikel Robin Williamson: The Iron Stone wurde in den Warenkorb gelegt. 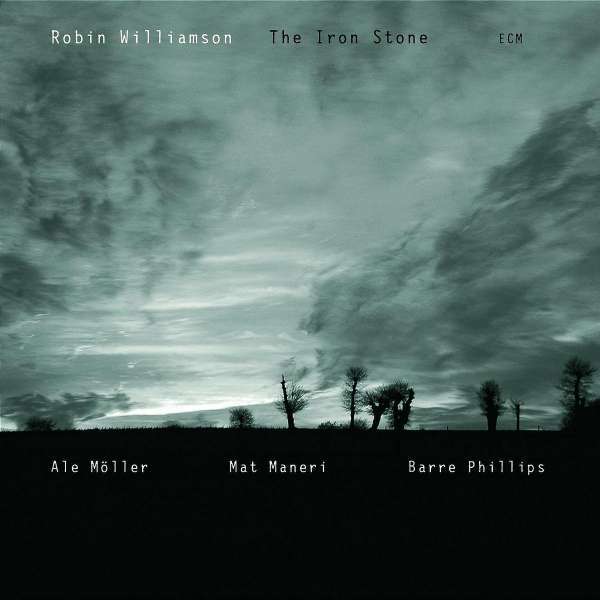 The Iron Stone” is the third of Scottish singer / songwriter Robin Williamson’s explorations of sung poetry on ECM and follows “The Seed-At-Zero” (2000) and “Skirting the River Road” (2002), the first a meditation on Dylan Thomas and other Welsh writers, the second including settings of the visionary poetry of William Blake and Walt Whitman. 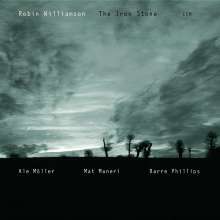 The new album has a wider embrace, with verse of Walter Raleigh, Thomas Wyatt, John Clare and Ralph Waldo Emerson, plus traditional folk music, and improvisations – as well as Williamson’s own poetry and songs, including two titles he once sung with the Incredible String Band in their most creative period: “The Iron Stone” and “The Yellow Snake”, both from 1968. Robin Williamson’s ISB, one of the most wildly original ensembles of its era, continues to be a touchstone for consecutive generation of musicians, currently cited as an inspiration by singers and groups of the new folk movement (which the mainstream press is variously calling psychedelic folk or freak folk) on both sides of the Atlantic. Williamson himself, though, has moved on – into increasingly fascinating collaborations with musicians from other idioms, particularly from the worlds of jazz and free improvised music, players fully capable of matching his wayward imagination to create songs in the moment or of joining him in the renewal of traditional forms (as on an extraordinary interpretation of the medieval Scots ballad “Sir Patrick Spens” here). Recorded in Abergavenny, Wales, (in the loft of an 18th century mill house, maintained as a studio by folk musician – and assistant engineer here – Dylan Fowler), “The Iron Stone” continues the association begun with viola player Mat Maneri and multi-instrumentalist Ale Möller on “Skirting the River Road”, and adds to the group the great bassist Barre Phillips, who quickly gets to the heart of things. Born in Edinburgh in 1943 Williamson has been a professional musician since he was 16 years old, and an innovator from the outset. He and Bert Jansch brought new impulses to British folk at the beginning of the 1960s. Then, with Clive Palmer and Mike Heron, Williamson founded the Incredible String Band whose songs, cross-referencing diverse cultures and with liberal use of ‘exotic’ instruments suggested a proto-‘world music’. The group’s most outstanding attribute was perhaps Williamson’s extraordinary melismatic vocals, at that time influenced by Arab and Indian singers as well as the great traditional folk singers of Scotland and Ireland. The ISB had several best-selling albums, including “The Hangman’s Beautiful Daughter”, a top 5 hit in the UK pop charts, and toured widely. After the group’s break-up in 1974 Williamson relocated to California where he published a novel, books of poetry and music instruction manuals, then resumed active music making as leader of the Merry Band. In the 1980s, back in Britain and now playing harp as his main instrument, he was a key figure in the storytelling revival. Through the 1990s he issued a number of albums on his own record label, Pigs Whisker Music, before coming to ECM. His recent live work has emphasized two duos, with his wife, singer Bina Williamson and with guitarist John Renbourn. He has also played a number of concerts with saxophonist Paul Dunmall. Ale Möller (born 1955), grew up in Malmö in Southern Sweden. Once a jazz trumpeter and guitarist playing swing and bebop, he left for Greece to study the bouzouki and the roots of rembetika, finally penetrating Greek music so thoroughly that he became a part of Theodorakis’s ensemble. On returning to Sweden he spent a decade investigating Swedish indigenous music in the Dalarna region, ‘translating’many fiddle tunes for the mandola and in the process contributing powerfully to the Swedish folk revival. He has co-directed recordings on ECM with singer Lena Willemark (“Nordan”, “Agram”, “Frifot”) as well as appearing on Robin’s “Skirting The River Road”. His own multi-cultural World Heritage Orchestra has been widely acclaimed. Mat Maneri was born in Brooklyn in 1969 and first began playing improvised music with his father, the inventive jazz saxophonist / clarinettist and microtonal composer / theorist Joe Maneri. Mat has appeared on five albums with Joe for ECM (“Three Men Walking”, “In Full Cry”, “Blessed, “Tales of Rohnlief” and “Angles of Repose”, the last two also featuring Barre Phillips), and also has a solo violin album, “Trinity” on the label. Other musicians with whom he has played recently include Cecil Taylor, Gary Peacock, Paul Motian, and Tomasz Stanko. Synthesising influences from Miles Davis and John Coltrane and from baroque music to Elliott Carter via the Schönberg / Berg / Webern Vienna School, Mat Maneri has become a uniquely expressive player. He continues to lead a number of bands of his own and has recently been emphasising a quartet with pianist Dave Burrell and drummer Randy Peterson. Barre Phillips, born 1934 in California, has been at the forefront of developments in improvised music over the last four decades. Ornette Coleman set him on his path around 1960, and on his arrival in New York, Phillips was soon working the extremes of the New Thing – playing improvised chamber music with Jimmy Giuffre on the one hand and freely expressive 'fire music' with Archie Shepp on the other. In 1969 he co-founded the powerhouse group called The Trio with John Surman and Stu Martin, which also appeared on his 1975 “Mountainscapes” album for ECM. His first recording for the label, however, was the duo album “Music for Two Basses” with Dave Holland. After further ECM recordings with Surman, and with Terje Rypdal, and the solo “Call Me When You Get There”, Phillips experimented with music for bass, percussion and tape on “Aquarian Rain” and mediated between Evan Parker and Paul Bley on “Time Will Tell” and “Sankt Gerold”. Based in France since 1972, Phillips has played with all the leading musicians in European improvisation. His current priorities include a trio with saxophonist Urs Leimgruber and pianist Jacques Demierre, which recently released an album on Evan’s Parker’s PSI label. He hasn’t often worked with singer / songwriters, but did contribute to Daevid Allen’s historic 1969 recording “Magick Brother”.